This is Dadaism a la Frank Zappa, that just dabbles in muddy Krautrock waters. The music is all about having fun whilst reaching the boundaries of the musical universe, which is why this band - in my collection is filed under Kraut. There´s a Kosmische vibe going on here, it ´s just infused by the spirit of mad jazzy beats and saxophone tirades, that occasionally makes me think of those crazy Canterbury bands. One of my favorite things on this record is the drumming. Fred Braceful is actually an American that sort of seeped into the German scene, but you could easily be fooled though, because he swings with these guys like you wouldn´t believe - even when the music gets cacophonous and avant garde, which also happens quite frequently - he´s there battling it out with his German accomplices. One of the most characteristic aspects of this debut is the organs, and if you´ve heard the new Norwegian fusion act Elephant9 and the way they wield the organs - then you´re not entirely off. Aggressive, snarling, heavy, psychedelic and distorted organs that most of the time sound like they are blasting through those old school speakers, where the artists had fiddled with the screws - or punched holes in the woofer to get that wild, blurry and messy sound. Like I said, this is perfect for climbing trees, and if you ever come across those silly birds, that chirp like: Piuw Piuuuuuw pow PI Pow - then you might be on to the very essence of these guys - their inspiration so to speak. 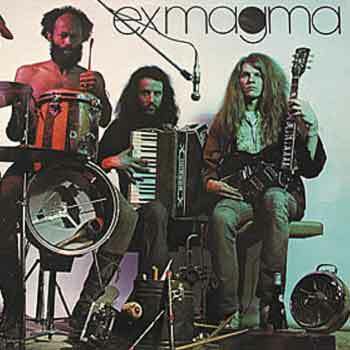 Like jazzy bebop - inter webbing different tonalities and rhythmic explosions - Exmagma utilizes the instrumentation similarly, but in a psychedelic and slightly more adventurous way( I still hear birds in that organ though). If you are curious about the world of Kosmische Musik, but feel more at home in the jazzier realms of experimental music, then I wholeheartedly recommend this album and this band. You just need 2 things now: One of Exmagma´s albums and a fully grown oak tree.